I’m excited to introduce Field Trip Friday – a time to share our experiences at all the places we’ve visited as a family! My mind reminisces every so often of childhood memories at Round Hill Park. With a bag of stale bread in hand, I’d hop out of the car and head straight for the lake where I’d lob hunks of crust at the ducks circling in the water. My grandparents took me most often, and as a former farm boy, my Pap was always glad to see my excitement at the animals there. Now visiting with my own little ones, I was so excited to feel the familiarity of this special place and thrilled to see some of the new updates to make the park even more fun for kids! 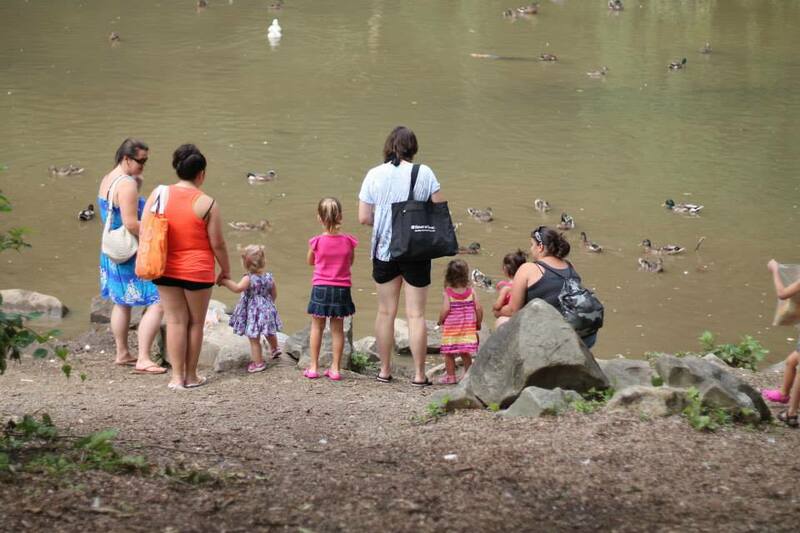 We made our way to Roundhill park last Friday on a gorgeous day with a few moms and kids from our playdate group. Special thanks to Sara from curouslittlekid,com and her “20 Things to do in Pittsburgh for under $20” post for the recommendation! After the pond, we visited the farm portion of the park where animals of sizes could be found! When you first pull in, this is to the right of the entry. A nice stroll through the buildings allowed us to see chickens, turkeys, sheep and pigs the later my kids just adored. Although I haven’t written much about my passion for photography quite yet (don’t worry – it’s on its way), I am learning to have an eye for great locations and Round Hill Park is definitely on the top of my list for a great Pittburgh photo session location! It has stone retaining walls, beautiful white farm fences and even great mildly sloping topography to provide some great backdrops. Fingers crossed we can make it there this fall to get a little session in with the kids! After visiting the animals, we got back in the car and headed towards the spray park. This area is to the left of the main parking lot in front of the entry road. For us, this was definitely a car ride but you could probably walk it if you were ambitious! 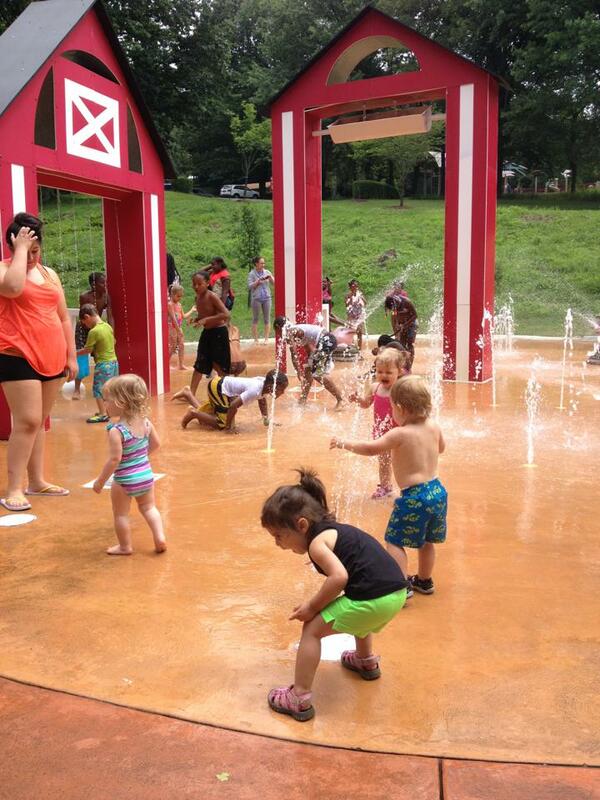 The spray park is provided free from Allegheny County and features numerous water features – fountains, sprays, and a barn that periodically dumps water on those standing beneath it. 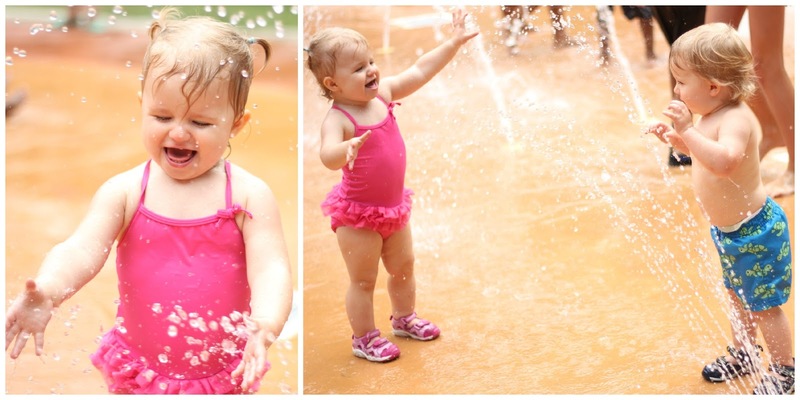 The kids had an absolute blast running through the spray and trying to touch all of the streams of water. Even though there were a few groups there when we attended, I felt like there was plenty of room for all of us. I’ll let the pictures speak for themselves on the fun that Brayden and Julie had there! There were a few park benches around the spray park area, but we took extra towels and a packed lunch which worked out well. There is also a pavilion and some playground equipment nearby if you are looking for something more substantial. Unlike the city Spray Parks (I believe), Round Hill Spray Park does have chlorinated water. I personally am thrilled about this as I feel like this could be kinda germy if the water wasn’t properly cleaned. Keep in mind I’m relying fully on my nose for this information so your mileage may vary. Finally, there are a few port-a-potties and at least one large portable stall designated for changing. No indoor facilities are there, but this works pretty well. We’d love for you to take one quick second and help us climb the Top Baby Blog ranks by clicking the link below! Special thanks to Katie of Katie Fair Photography for sharing some of her pictures with us for this post! Looks like you guys had a blast! Thanks for the shout out. I’m always excited to spread the word about amazing places we have the pleasure of stumbling across. Beautiful pictures from Katie Fair. I’ve been wanting to take photography up as a hobby so I can’t wait to hear more! Fun! The military posts here have splash parks..but unfortunately we are not military! Boo! Looks like fun! Thanks for sharing at FTF!